The Sharingan (Copy Wheel Eye) is a special type of eye that naturally appears in some of the members of the Uchiha clan. The Sharingan allows the user a number of abilities and is a dojutsu (pupil technique). One of the things Sharingan can do is that it can percieve and copy ninjutsu (ninja techniques), genjutsu (illusionary techniques), and taijutsu (hand-to-hand techniques) with perfect accuracy and allow the user to use the techniques, as long as they have the necessary resources (like chakra) to do so. Second, it is capable of a unique brand of hypnosis that involves suggesting actions and thoughts to the opponent. Third, it can see through genjutsu, the level of which is possibly dependent on the user's skill. Fourth, it has the ability to predict an opponent's movement as well as allowing sight of fast moving objects with great clarity. The weakness of the Sharingan, in Kakashi's case, is that it drains chakra quickly. In order to copy a jutsu, one has to have the physical ability to perform the technique. For example, they have to have the needed amount of chakra, stamina, agility, and/or strength in order to perform said technique. In addition to physical skill, the Sharingan cannot copy any other bloodline abilities or summon a creature the user has not made a contract with because the user of the sharingan has to have the same blood of the other summoning user. In Itachi's and Sasuke's case, their chakra is still drained, but incredibly more slowly, due to the fact that they have the actual Kekkei genkai of the Uchiha clan. The Sharingan does not automatically appear from birth in a user; instead, it will usually appear when the user is in a life threatening situation, where the power of the Sharingan will save the user. After this first appearance, the user can then call up the Sharingan any time he or she pleases. (Due to its unique nature, Kakashi's Sharingan seems to be "permanently on", and thus he covers it except during heated battles, to conserve chakra.) Interestingly enough, it is possible to transplant Sharingan eyes from one person to another, as is the case with Kakashi and his deceased comrade Obito Uchiha. However, transplanted eyes do not work as well without an Uchiha body, causing much more strain on the user. The power of the Sharingan is judged through the number of tomoe in the person's eye. Below are the types of Sharingan one can have. The Mangekyo Sharingan (translation: Kaleidoscope Copy Wheel Eye) is a heightened form of Sharingan which was once thought have been attainable only by members of the Uchiha clan, and even those who have the potential to obtain it must make a great sacrifice in order to obtain it - according to Itachi, they must kill their best friend. In the present, there are only two known people who can use the Mangekyo Sharingan: Itachi and Kakashi. 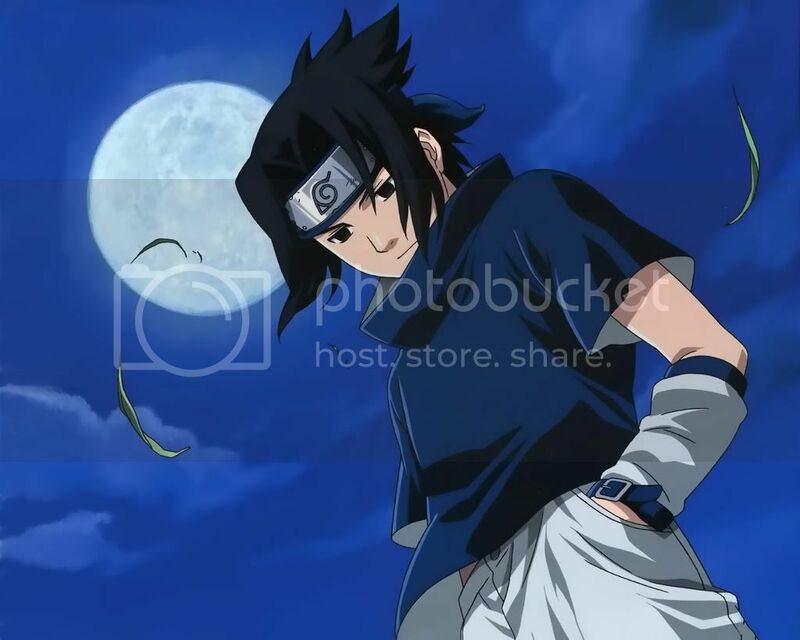 According to Itachi, if his younger brother Sasuke obtained the Mangekyo, the number of people who could handle the Mangekyo Sharingan (including Itachi and Sasuke) would be three. Using this type of Sharingan Itachi can create a mysterious and very powerful black fire, liek the one he used to escape from Jiraiya's inner frog mouth barrier. It also allows the use an illusion technique. Itachi looks into his opponent's eyes and cast a Genjutsu spell on them. This allows Itachi to have full control over space and time and can place his opponent to be in any world for as long as he wants. The technique itself only lasts a short while in reality, however, to the opponent it feels like an eternity. As far as we know, only Sasuke can overcome this technique because he is a pure Uchiha with the power of Sharingan.. It is somehow capable of creating an interdimensional space-time warp. Kakashi uses it to warp Deidara's right arm into a different dimension. He subsequently uses it again in Chapter 278 to counter Deidara's ultimate move, which would otherwise level the entire forest they were fighting in. However, the attack requires considerable effort to aim precisely and appears to leave Kakashi's chakra significantly drained: he collapses after using the technique three times. Although this eye is labeled as Mangekyo Sharingan, it is not exactly the same as the version that Uchiha Itachi uses. The appearance of the pupil and tomoe differ from that of Itachi's. Kakashi's tomoe seem more like a pinwheel than a kaleidoscope. Before this was shown, it was thought that one had to have Uchiha blood and had to kill their best friend to acquire the Mangekyo Sharingan. Kakashi is not an Uchiha, and he stated long before developing his Mangekyo Sharingan that everyone close to him was already dead.